Excellent 2 bedroom, 2 bathroom, front line Cabo Roig apartment. * Shared Swimming Pool * Front line South Facing Sea view * UK Satellite TV Channels * Hot & Cold Air Conditioning * Washing machine & Dishwasher * Secure Private Parking * Suitable for children of all ages * Elderly Friendly Property * No Smoking Property * Close walking distance to amenities * Sleeps 4 * 1st Floor *Balcony 'al fresco' dining * Lift * Available all year round * No Smoking Property * Great value prices. 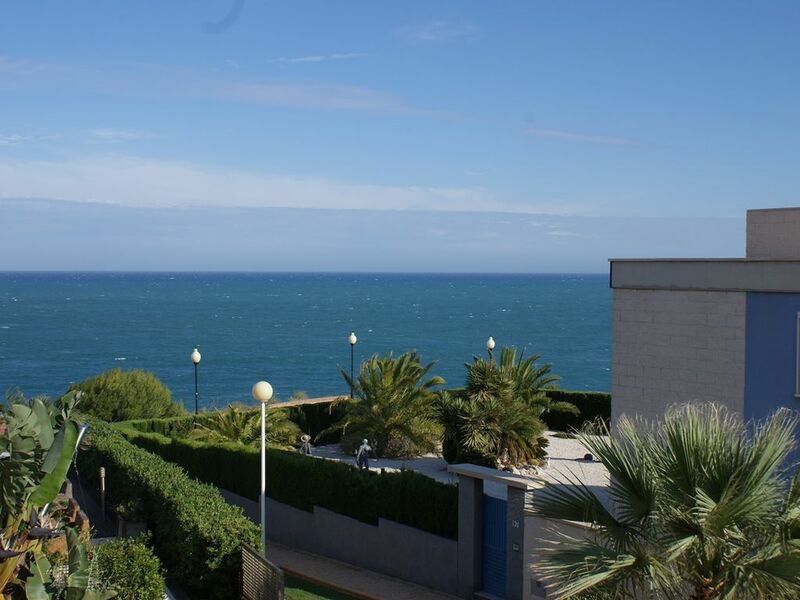 To the outside the Cabo Roig apartment enjoys fabulous, breathtaking, front line views over the Mediterranean Sea from its 1st floor, south facing balcony and on a clear day the stunning island of La Manga can be viewed. The outside balcony runs the length of the apartment and can be accessed through the master bedroom and main living area and has outdoor patio furniture ideal for 'al fresco' dining for morning and afternoon sunshine. The gated community has a superb large communal pool area with separate jacuzzi and overlooks the sea and is 50 metres walk from the apartment through the well-kept grounds, pathways, lush green lawn, palm trees and colourful plant life. There is a secure underground garage area with allocated car space and lift access to the apartment. The accommodation comprises of 2 good sized bedrooms with ample wardrobe space allowing up to 4 people sleeping. There is 1 master bedroom with double bed leading to a sunny balcony and twin bedroom with 2 single beds. There is a separate fully tiled bathroom suite with toilet, bidet, bath with overhead shower, sink, mirror and cupboards plus a fully tiled Shower room with toilet, cubicle shower and sink. A well equipped kitchen with new dishwasher, oven, hob, microwave, fridge, freezer, toaster and kettle plus full utensils, crockery and pans are provided and separate utility room with washing machine. The main living area is open plan, well furnished and has indoor dining along with comfortable and relaxing sofas. Home comforts include TV with UK channels inc HD BBC1. BBC2, ITV1, C4 and C5 plus more. There are also DVD and CD players. The property has been fitted with hot and cold air conditioning in both bedrooms and main living area. The lovely seafront promenade is accessed via private gate from the garden grounds and is a flat, scenic, less than 10 minute stroll to the sandy beach at Cabo Roig marina with the local beach at Campoamor even shorter. Cabo Roig is an exclusive and beautiful resort located on the popular Orihuela Costa section of the Southern Costa Blanca with stunning views over the Mediterranean sea to La Manga. There are plenty of great sandy blue flag beaches to enjoy in Cabo Roig including Cala Capitan and Cala Caleta, both are well maintained and are extremely popular during the summer months. It has a superb marina and an picturesque and enjoyable cliff walk to La Zenia. offering some exceptional views of the surrounding coastline. A growing variety of local cafe bars and restaurants plus specialist shops along the 'Cabo Roig strip' make this area a great getaway holiday experience all year round. There are popular Street markets held on Thursdays, with a bigger market on Fridays in Torrevieja. The climate is one of the most agreeable in Europe with daily coastal temperatures in the spring and autumn months rarely dropping below a very acceptable 16 to 20 degrees centigrade and 30 degrees plus in the height of summer with a welcome cooling sea breeze. Cabo Roig is just a short drive from three excellent golf courses at Villa Martin, Campoamor and Las Ramblas. One of the best known sights in Cabo Roig is the 16th century watchtower around which Cabo Roig primarily grew and a reminder of its history when watchtowers were built along coastal fronts to look out for approaching Berber pirates who frequently attacked villages along the coastline. The watchtower now looks down on the recently renovated marina with its 200 plus moorings. If you feel you want to explore a little further afield then there are lots of other things to do in and around Cabo Roig. Take a trip into the busy town of Torrevieja or in the summer months visit the fantastic Aquopolis (aqua splash park) with its water chutes and slides, great family fun. You may also want to visit one of the historic cities in the region, Alicante, Cartagena and Elche. The Orihuela Costa is accessed by both Murcia Regional Airport Corvera 30154 ( 43 mins away ) and Alicante airport (50 mins away). Cabo Roig is situated on the N-332 coastal road between Pilar de la Horadada and Torrevieja. It can also be easily accessed from the AP-7 motorway, junction 763 (La Zenia) or junction 768 (Dehesa de Campoamor). Email quote from Tore Raa from Norway July 2018 - The professional processing done by Rent Costa Blanca (communication, reservation, payment etc.) is absolute 100% all the way! Great holiday again here. Email quote from Mr Wardle in Stockport Aug 2017 - We had a great time, and we're delighted with the apartment. We just wanted to say thank you for a wonderful stay in your apartment. We had such a lovely time. Your apartment is beautiful and we loved every minute there so we hope to be back in the future. Waking up to the stunning view of the sea every morning is something we didn't want to leave especially as it was also so quiet and peaceful. Thank you we had a great time and the apartment was very nice.